Is it already February? I don’t have my valentines made, EEEP! But these lil panda bears are TOTALLY helping me out in getting rolling. 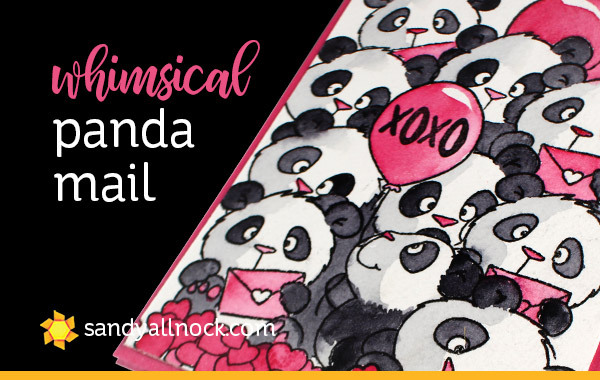 The Lovely Pandas from Gerda Steiner were so adorable, I just had to buy them….I painted them as black and white pandas…but wouldn’t they be cute as rainbow pandas too? When doing a masked scene like this, start from the bottom and work your way upward so everything looks like it’s “behind” everything else. The little panda that only has a head and paws – you’ll need to ‘hide’ the straight lines to make them look like they’re really full bodies. Blog note for Wednesday: a ‘flash’ giveaway of some valentines stamps! Be sure to set an alarm on your phone and pop back over to qualify to win! Hello, Ms Allnock, I think your cards are truly remarkable and you do an extremely nice job on them! I love your videos and that pile up of pandas is no exception. I’ve never watercolors before. But I might try it someday when I get watercolors. Do you know which type I should get as a complete beginner? I’m new to stamping and coloring, as a whole! My hobby is mostly cross stitching. And only got into stamping to combine the two, but these videos is kinda pushing me to try stamping altogether. Thanks for your goes. Fun card and video. I always pick up a tip or two watching you paint. 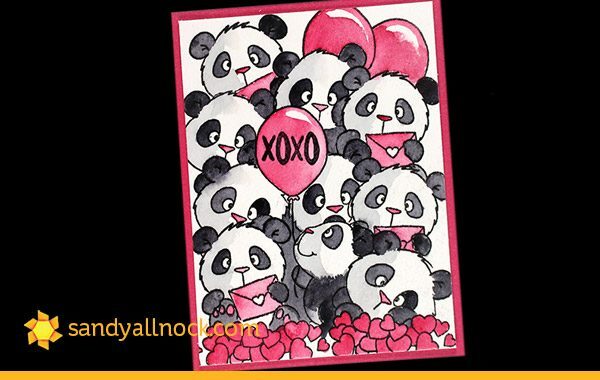 Such a CUTE panda card! Thanks for the video! Oh this is so so sweet! Ultra cute stamps and of course, the finished card. Love the simple color way. I’ll have to go search my stamps to find a set that I can do this with… Thank you for a clean and easy idea for a Valentine greeting! So so cute…By the way I’ve been busy with your shadow casting class and I have loved every minute of it…Thank you as a card maker and watercolor beginner I can only see benefits in taking it. Lone the black and white with a pop of colour. Very timeless. Thank you for the opportunity to win. Love your channel! What a great lovely card, those Pandas are so cute. Thank you so much for showing Sandy. I LOVE what you did with these cuties. Already have these stamps in my stash and now I have a great idea what to do with them. As always, I am inspired by your talent. Thanks. Adorable indeed, and inspiring to try some watercolouring using a simple colour combo. Those pandas are so cute. I love your card. Such a cute card Sandy! Great card as always Sandy!